Searching for a good hair transplant doctor can be a meticulous job. In large metropolitan areas such as Los Angeles, for cosmetic and hair transplant surgeons come far and wide. Compared to other cosmetic surgical procedures, hair transplant surgery and in particular follicular unit transplantation is one of the newer branches. Across Southern California you can find a variety of hair transplant surgeons with different levels of experience. Some of the updated surgeons practice in Los Angeles have plenty of work to show for it. Overall, hair restoration and other cosmetic procedures should not be taken lightly. Just because you see a billboard stating “the best Los Angeles Hair Transplant Surgeon” or “the most experienced Hair Transplant surgeon in Southern California” does not make it a true statement. Now in days, most hair transplant surgeons offer a free initial hair transplant consultation. You need to remember that the end result is permanent and it should be to your liking. Take advantage of the situation and shop around. It isn’t enough to just visit several hair transplant doctors; you also need to educate yourself on the hair transplant process, the surgical techniques and the hair transplant surgeon’s background before visiting the doctor. By doing so, you can appreciate a good technique and a knowledgeable doctor when you see one. 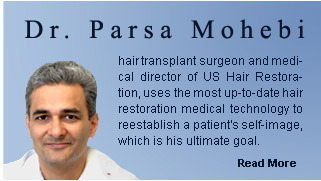 Parsa Mohebi Hair Restoration offers a free physician consultation for everyone and we specialize in state-of-the-art exclusive follicular unit transplants (FUT), mega sessions for people with extensive hair loss and follicular unit extraction (FUE), or minimally invasive hair transplant that does not leave a scar in the donor area. In today’s world it is important to look and feel your best. Modern hair transplant surgery with undetectable results has become a demanding field in Southern California within the last few years. Southern California is the Mecca of hair transplant surgery and one of the best places to go when you want to get the best.